Spider mites are members of the Acari family Tetranychidae, which includes about 1,200 species. They generally live on the undersides of leaves of plants, where they may spin protective silk webs, and they can cause damage by puncturing the plant cells to feed. Spider mites are known to feed on several hundred species of plants. Spider mites are less than 1 mm (0.04 in) in size and vary in color. They lay small, spherical, initially transparent eggs and many species spin silk webbing to help protect the colony from predators. They get the "spider" part of their common name from this webbing. Spider mite development differs somewhat between species, but a typical life cycle is as follows. The eggs are attached to fine silk webbing and hatch in approximately three days. The life cycle is composed of the egg, the larva, two nymphal stages (protonymph and deutonymph) and the adult. The length of time from egg to adult varies greatly depending on temperature. Under optimum conditions (approximately 80ºF), spider mites complete their development in five to twenty days. There are many overlapping generations per year. The adult female lives two to four weeks and is capable of laying several hundred eggs during her life. To the naked eye, spider mites look like tiny, moving dots. However, you can see them easily with a 10X hand lens. Adult females, the largest forms, are less 0.04 inches long. Spider mites live in colonies, mostly on the undersurfaces of leaves. A single colony may contain hundreds of individuals. 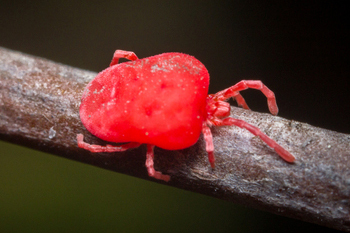 The names “spider mite” and “webspinning mite” come from the silk webbing most species produce on infested leaves. The presence of webbing is an easy way to distinguish them from all other types of mites and small insects such as aphids and thrips, which can also infest leaf undersides. Adult mites have eight legs and an oval body with two red eyespots near the head end. Females usually have a large, dark blotch on each side of the body and numerous bristles covering the legs and body. Immatures resemble adults (except they are much smaller), and the newly hatched larvae have only six legs. The other immature stages have eight legs. Eggs are spherical and translucent, like tiny droplets, becoming cream colored before hatching. Spider mites feed by piercing the leaf surface with stylet-like chelicerae and extracting leaf cells and fluid. This manner of feeding causes tiny holes to be punched into the otherwise protective, waterproof leaf surface. Leaves normally control water loss through a system of stomates, or valves, that can be opened and closed. When the stomates are closed, the surface of a leaf is highly resistant to water loss. Spider mite feeding disrupts this system by creating holes that allow water to escape. This uncontrolled water loss eventually dehydrates the leaf. Injured leaves are shed more quickly and eventually the whole plant may die. Even a minor spider mite infestation can have a significant impact on a plant's health.